christineiscooking.com: How To Make Spaghetti Sauce From Fresh Tomatoes (No Peeling No Seeding)! How To Make Spaghetti Sauce From Fresh Tomatoes (No Peeling No Seeding)! Have tomatoes? I usually have a pretty good supply of container tomatoes I grow on my screened in patio. 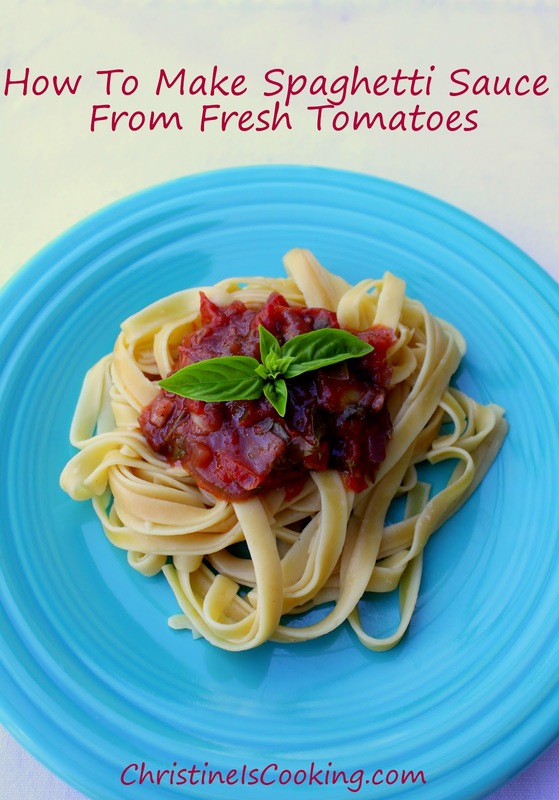 This from scratch marinara sauce is easy and delicious! This method is something I learned from my Italian mother in law many many years ago. Many people seed and peel their tomatoes before making sauce, but if you use young or smaller tomatoes and cook the sauce until the peels are very tender, it isn't necessary to do either of those steps. This recipe makes about 3 cups of sauce. It literally bursts with flavor! Approximately 1 1/2 pounds of fresh small to medium tomatoes finely diced. 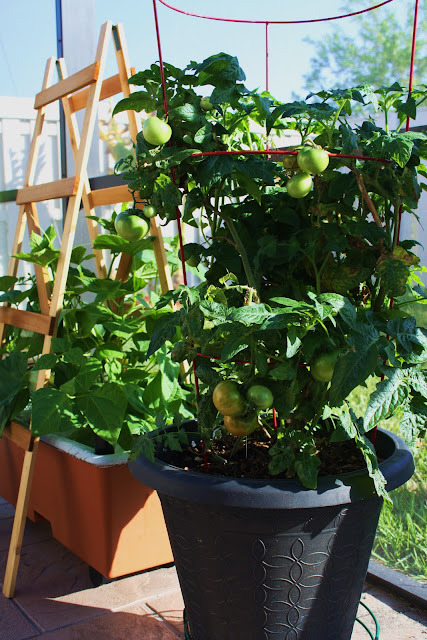 I have used heirloom cherry tomatoes from Space Girl Organics (sauce pictured above), Compari tomatoes, and the container tomatoes I grow myself). 1 large handful of chopped fresh italian flat leaf parsley (this is about a 1/2 cup). I just use the leafs, not the stems. In a heavy pot, simmer the garlic and onion in the olive oil over medium to medium high heat until it is soft and translucent (do not brown). Stir in the tomatoes, salt, pepper, water, wine and parsley. Cover 3/4 of the pot with a lid and continue to cook over medium high heat until the tomatoes are soft (10 minutes or more). Remove the lid. I like to squish the tomatoes in the pot with a potato masher very well at this point. Continue to cook the sauce until it thickens and reduces by 50 to 75 percent and the peels from the tomato are very soft (for me this was 30 minutes). Stir the sauce occasionally so the bottom does not burn. Tip: I use #7 on my stove top for medium high heat. Cook time for the sauce to thicken may vary depending on the type of tomatoes you use and their water content. Thank you for this. Any kind of Italian food is my favorite. I will be making this very soon!